The right set of keys can make or break your production workflow depending on what you’re trying to achieve. This article will provide an honest, unbiased, and in-depth review of the Akai LPK25 Laptop Performance Keyboard to help you make an informed decision in your search. 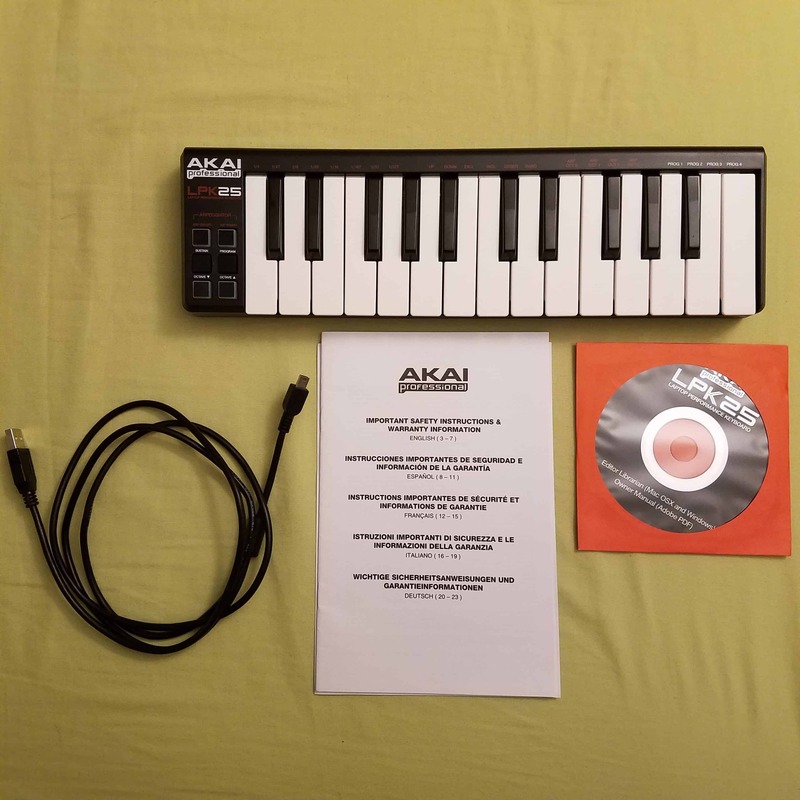 The Akai LPK25 is a great beginners MIDI keyboard for those of us who are looking for a set of keys that won’t break the bank. This lightweight and portable controller is great for the on-the-go music producer, as well as live performances with the built in arpeggiator function. Plug-and-play connectivity make for an easy setup. I’ve personally owned and used the LPK25 to produce music for over a year now with no reliability issues, which seems to be a real concern for other buyers. The main problem people are having is with the USB connector. I don’t move it around or unplug it too much, so this may help prevent damage to the connector. For intermediate or advanced musicians, namely those who are skilled with the piano, my suggestion is to look elsewhere for a larger weighted or semi-weighted (and more expensive) keyboard controller such as the Nektar IMPACT LX88+. The Akai LPK25 faces stiff competition from comparable 25-key MIDI keyboard controllers such as the Korg microKey25, M-Audio Oxygen25 MK IV, Nektar IMPACT LX25+, and the immensely popular Akai MPK Mini MKII. It’s worth mentioning that each of these competitors offer other additional features such as launchpad buttons, faders, and knobs, and also come with a heftier price tag. For a simple set of keys, I think the LPK25 is worth it. If you think shes’s a keeper you can buy your very own Akai LPK25 right here. OK, let’s dig in to the details! This 25-note velocity-sensitive mini keyboard operates through a plug-and-play USB connection and can connect to any Windows or Mac PC. It comes with the appropriate 6 ft USB-mini cable, manuals, and Editor Librarian software on CD. 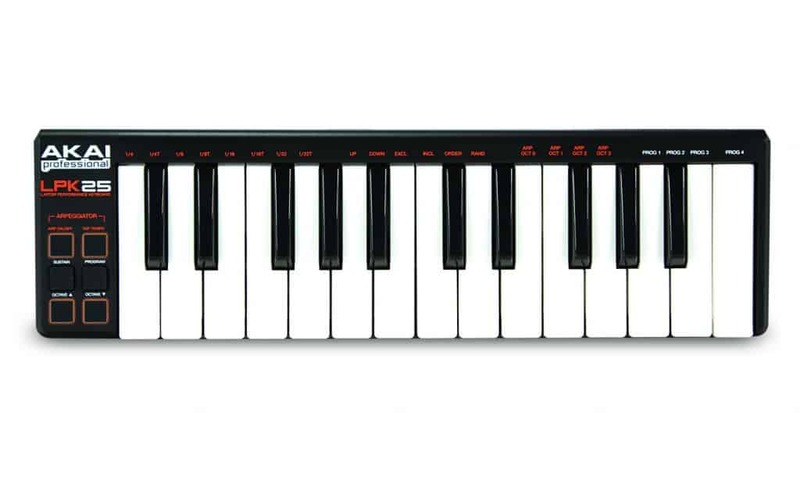 The LPK25 has a built-in arpeggiator that sends MIDI data and can be toggled on and off. You can change the arpeggiator tempo by repeatedly pressing the TAP TEMPO button. The arpeggiator will automatically match the tempo that you’re tapping at. The number of taps required to set the tempo can be changed within the Editor Librarian software. Holding down the arpeggiator toggle button and pressing one of the labeled keys will allow the user to change different arp settings. With the arpeggiator turned on and the SUSTAIN button enabled, you can hold down a combination of keys and the arp will continue to play the notes. You can also change the arpeggiator mode, time division, or octave while the SUSTAIN button is activated. You can access loaded presets by holding down the PROGRAM button and selecting one of the PROG 1 – PROG 4 keys. The software that comes with the LPK25 allows the user to edit, save, or load presets for the controller on the user’s computer. MIDI Channel – sets which channel the LPK25 will send MIDI messages to when that preset is activated. Compatible with many big-name DAWs such as FL Studio, Ableton Live, Pro Tools, Cubase, and more. The keys are overly springy, non-weighted, and may take getting used to for piano players. Too small for anyone wanting to record live piano sessions. Thanks for reading, and I hope this will help you find the right set of MIDI keys for your specific application!